Just because the summer travel season has ended, your travels don’t have to wait for Christmas. Here are some Halloween attractions that are sure to delight your family with spine-tingling chills or spooktacular displays. So jump in the car and head out to explore one of these great fall activities! See more than 5,000 individually hand-carved, illuminated jack o’ lanterns in this elaborate walkthrough experience. Meander through an historic, 18th-century riverside landscape and discover a breathtaking display — all made of jack o’ lanterns! Recommended for all ages. Toms River Fire Co. 76th Annual Halloween Parade Toms River, NJ (http://www.occis.com/events/halloweenparade/index.html) From simple masks to full blown articulated fire-breathing floats Toms River NJ has become the Halloween Capitol of the Universe! Toms River Halloween Parade is the 2nd largest in the world according to Guinness Book of World Records! Thanks to Beth from trekaroo for the tip! Hallowe’en in Greenfield Village Dearborn, MI (http://www.thehenryford.org/events/halloweenEvent.aspx) Enjoy our historically themed Hallowe’en event. Follow a mile-long, curving path illuminated by the flickering light of hand-carved jack-o’-lanterns and meet classic costumed characters along the way. Feel the chilly whoosh of air as the Headless Horseman rides out of the shadows of Firestone Farm’s fields, and banter with witches, wizards and dancing skeletons. They’re everywhere along Jack-o’-Lantern Boulevard. The good news is that you can bring the entire family. This is a kid-friendly, nightmare-free Halloween gathering. Pony Express PumpkinFest St. Joseph, MO This free, family arts festival is held the second full week-end in October each year. Come and celebrate the fall harvest at the annual Pony Express PumpkinFest. Live entertainment, children’s costume parade, festival rides, games, crafts and food. Anoka, MN – Halloween Capital of the World® Anoka, MN (http://anokahalloween.com/) Anoka has always worked to keep a family spirit alive in its Halloween festivities. Activities have included pillow fights, a kangaroo court, fireworks displays, royalty coronations, concerts, dances, window painting contests, house decorating contests, celebrity appearances, costume contests, style shows, story-telling, races and, in the 1960s, a snake dance that took long lines of participants in and out of area businesses and homes. Keene Pumpkin Festival Keene, New Hampshire (http://pumpkinfestival2011.org/) Three hundred and sixty-four days a year Keene, NH, is a quintessential New England community with a pristine church at the head of a welcoming square. On October 18, 2014, that square will abound with jack-o’-lanterns carved by area school children! The bandstand will come alive with entertainment and a tower of pumpkins so spectacular it is called “spell-binding” will rival the church steeple. Delectables in the Food & Craft Court will send forth aromas of apple crisp and maple cotton candy throughout the pumpkin-lined city streets. 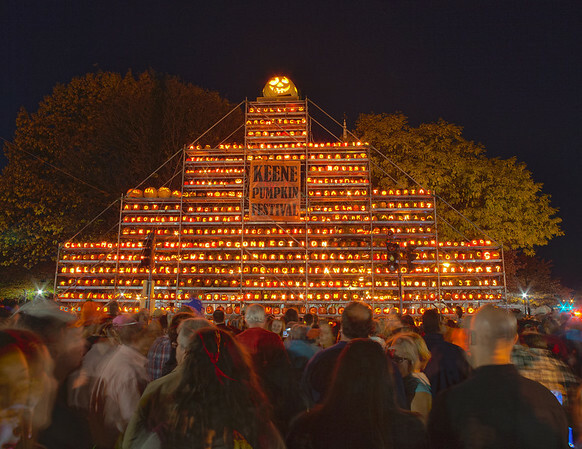 After reclaiming the WORLD RECORD in 2013, Keene is on top of the world and Keene Pumpkin Festival is the darling of New England events. Admission is a suggested donation of $5 per adult plus a carved pumpkin. PEANUTS™ Pumpkin Patch Express Bryson City, NC (http://www.gsmr.com/create-content/event/about-peanuts%E2%84%A2-great-pumpkin-patch-express/fall-leaf/fun-things-in-western-nc#.VBtvnPldXng) Guests will hear a narration of Schulz’s “It’s The Great Pumpkin, Charlie Brown” as the train travels to the Pumpkin Patch. Upon arrival, passengers will be greeted and have a photo opportunity with Charlie Brown, Lucy, and Snoopy. During your 1 hour and 45min layover, your activities to enjoy at The Great Pumpkin Patch will include: campfire marshmallows, a coloring station, temporary tattoos, trick or treating, bouncy house, hayrides and live musical entertainment. And kids, don’t forget to wear your Halloween costumes! There will be plenty of PEANUTS™ merchandise at the Smoky Mountain Trains gift shop! Each child will also select their own pumpkin from The Great Pumpkin Patch to take home. Cool Patch Pumpkins Dixon, CA (http://coolpatchpumpkins.com/) Labeled as “The Coolest Maze on the Planet,” this year’s mind-twister will not disappoint coming in at over 50 acres. We’ve got plenty of activities for everyone in the family, including an African Grass maze for the little ones, the ever popular Corn Bath quicksand pit, tractor pulled hay rides, pedal cars, an Indian village complete with TeePees, a fully stocked refreshment stand with specialty coffee drinks, sandwiches and candy, and endless varieties of pumpkins. Also, watch for details about our annual scarecrow contest! Vala’s Pumpkin Patch Gretna, NE (http://www.valaspumpkinpatch.com/) With over 50 attractions and activities at Vala’s Pumpkin Patch, plan to spend most of your day exploring all the farm has to offer. From the classic hayrack ride to the pumpkin field to our giant bouncing pillows, there’s sure to be something for everyone. Siegel’s Cottonwood Farm Crest Hill, IL (http://www.ourpumpkinfarm.com/) Siegel’s Cottonwood Farm is a family owned & operated farm. We are the place to harvest your family memories on our 40 Acres of Affordable Family Fun®. Jumbo’s Pumpkin Patch Middletown, MD (http://www.jumbos.org/index.html) Farm visitors can enjoy hayrides to the pumpkin patch and corn maze, petting zoo, pony rides, Snack Shack, shopping in the General Store and Craft Attic for a variety of handcrafted items from over 45 local artisans. Enjoy a fun family vacation where dreams come true by visiting Disneyland Halloween Time activities like our family did, or head to the other coast and take part in Mickey’s Not So Scary Halloween Party at Walt Disney World. Ghost Train at Tweetsie Railroad Blowing Rock, NC (http://tweetsie.com/special-events/ghost-train/) Nighttime events in the park including the ride on the Ghost Train, Trick-or-Treating for the kids, Haunted House, Tweetsie Palace Spooktacular, the rides in the Creepy Carnival, and the attractions in “The Boneyard” section, featuring the Black Hole, 3-D maze, and the “Freaky Forest.” Read more about the Ghost Train at Hines-Sight. Knott’s Berry Farm Buena Park, CA (https://www.knotts.com/what-s-new/events) Enjoy Halloween fun in Camp Spooky every weekend in October and on Halloween Day. This daytime event is a non-scary celebration of cheer rather than fear with shows and activities all geared for kids ages 3-11. Admission to Camp Spooky is included with your Knott’s Berry Farm admission. If you’re looking for a gruesome, scary event head to Knott’s Scary Farm for activities pulled straight from your worst nightmares. Silverwood Theme Park Coeur d’Alene, ID (http://www.scarywoodhaunt.com/) Silverwood is a great place to take a family vacation and filled with sweet and fun rides for the whole family. In the fall they open Scarywood Haunted Nights, where nightmares are made and scares abound. Terror Behind the Walls 2014 from Terror Behind the Walls on Vimeo. Eastern State Penitentiary Terror Behind the Walls Philadelphia, PA (http://www.easternstate.org/halloween) Terror Behind the Walls is located inside the massive castle-like walls of Eastern State Penitentiary in Philadelphia, PA. Now in its 22nd year, Terror Behind the Walls is consistently ranked among the top haunted attractions in the country. The Edge of Hell and The Beast Kansas City, MO (http://www.edgeofhell.com/) I actually grew up visiting these haunted houses and still remember some of the unbelievable frights I had when visiting. These two houses are part of a complex of four houses in the West Bottoms of KC. The West Bottoms, just west of Downtown Kansas City off the 12th Street Bridge, has defied the downturn in haunt offerings and reigns as the Haunted House epicenter with four large haunted houses in this one historic community. The four houses (Chambers of Poe, Macabre Cinema, Edge of Hell and The Beast) are regularly named among the 10 scariest haunted attractions in the U.S. The Queen Mary’s Dark Harbor Long Beach, CA Imagine what haunts lurk aboard an old ship…This year’s Dark Harbor is thrilled to unveil a spectacle of new attractions that include two brand new mazes and the new Voodoo Village. Beloved veteran characters including The Ringmaster and all grotesque spirits of the Queen will make a chilling return for 20 nights of delightful terror amidst freaks, food, and live entertainment. Are you planning to visit any of these attractions? Did I forget one of your favorites? Please comment below and tell me all about your favorite Halloween attractions!